1. Slip a segment of PVC pipe inside one of the bottom port on the Slip Tee. 2. 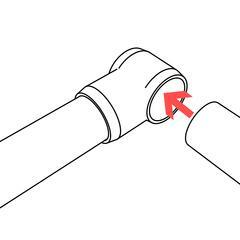 Push or tap into place until the pipe hits the stop inside of the Slip Tee. 3. 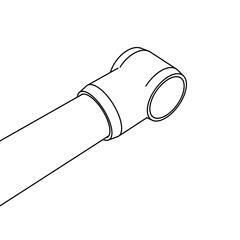 Insert a segment of the same size PVC pipe into the 'sling' end of the Slip Tee. Do not secure in place with PVC cement or screws. 4. 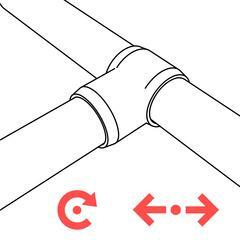 Rotate the perpendicular pipe segment to create a hinge, or slide the slip tee along the pipe to create a sliding mechanism. Do not use PVC cement to secure the sling end, as it should remain loose to act as a hinge. The closed socket can be permanently connected with PVC cement to attach the PVC pipe and fitting. 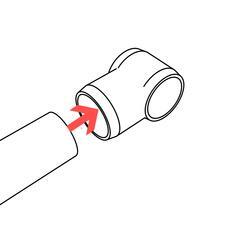 You can also temporarily connect the socket using a threaded screw inserted through where the pipe and fitting meet.